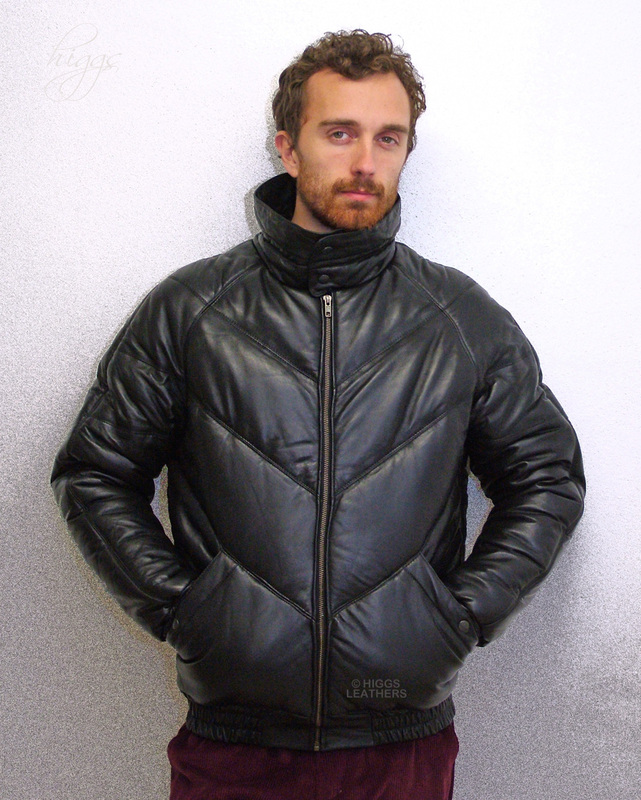 Men's extra soft Black Leather Puffa Bomber jackets, made from fine quality Lamb Nappa skins. Easy fitting body with diagonal padded quilted stitching that tapers to a ruched leather waistband with deep cut Raglan sleeves that also taper to ruched cuffs. Deep mandarin collar that can be worn fastened high in the neck as pictured or turned down away from the face. Two full size slanted pockets with metal press stud fastenings plus two full wallet size inner pockets with zip fastenings. Body fastens with a strong metal zip. Poly/Satin lining with padded thermal interlining for super extra warmth. Jacket length approx. 26" (66 cm).